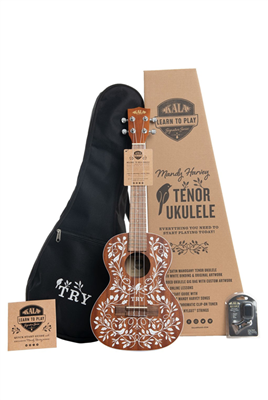 The Mandy Harvey Learn To Play Signature Series Tenor Ukulele is made of Satin Mahogany and includes white binding and original artwork reminiscent of 1800s Swiss folk art. The delicate vine pattern with birds and flowers was created by Mandy’s sister, making this a very personal, one-of-a-kind piece of art. Mandy is a singer, songwriter, author, and inspirational speaker who lost her hearing at the age of 19. She came to national attention on Season 12 of America’s Got Talent. Her inspiring performances have been viewed millions of times and won the coveted “Golden Buzzer” from Simon Cowell. This uke comes with everything a beginner needs to start playing songs right away, including Mandy’s most popular songs, accessible via the free Kala App, free online lessons, or the included booklet. Width at upper bout: 7"
Width at lower bout: 9.125"
Fingerboard width at nut: 1.39"
Fingerboard width at neck/body joint: 1.8"